(TibetanReview.net, Jul21, 2016) – China has given a three-year jail term to a Tibetan monk more than 10 months after keeping him in detention for staging a lone street protest in Ngaba (Chinese: Aba) County of Sichuan Province, reported the Tibetan Service of Radio Free Asia (Washington) Jul 19. The report said the monk, named as Lobsang, was tried and sentenced at a secret trial. The monk was reported to have disappeared after his arrest on Sep 10 last year, with his family being kept in the dark about his whereabouts and situation or even when he was tried and sentenced. The monk had staged his protest on what the local Tibetans call ‘Heroes Street’ in the county seat on Sep 10 last year. He had shouted calls for Tibetan freedom and prayers of long life for Tibet’s exiled spiritual leader, the Dalai Lama. He was severely tortured and beaten during his 10-month detention, the report cited an exile Tibetan source with local contacts as saying. Lobsang’s protest had followed three similar protests in Ngaba within a week, because of which China had blocked all channels of communication in the area, including the internet and mobile phone services, resulting in his protest going unreported in the outside world until now. 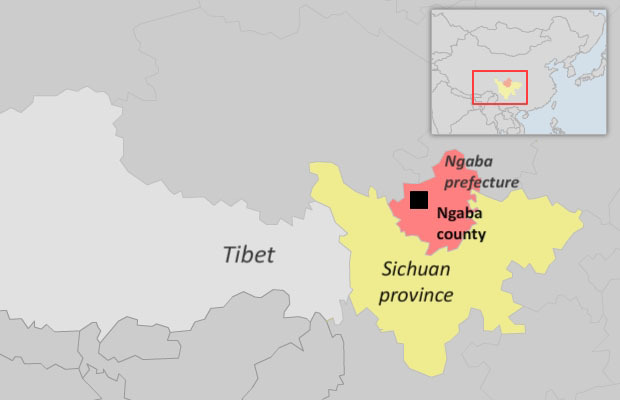 The monk is said to be held in Moxi Prison, located about 300 miles away from Ngaba County. His family remains deeply concerned about his health in the absence of any contact with him.